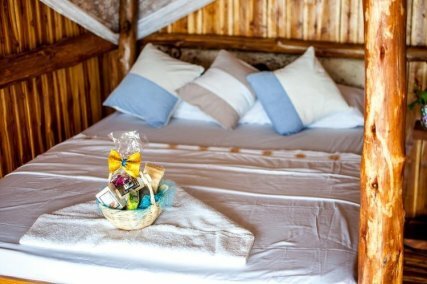 Located in Popoyo, on the beautiful Emerald Coast of Nicaragua, Magnific Rock offers guests a unique, inspirational experience. We have a variety of accommodation options, restaurant and bar, 270 to degree views of the Pacific Ocean, yoga, surf, wellness spa, pool, outdoor activities and more! Make the most of your trip with one of our great packages. They have been carefully designed to showcase the best of what Magnific Rock and our region has to offer. Select from surf, wellness, romantic or yoga packages. We also give you the freedom to build your own personalised package incorporating all of your wishes, hopes and dreams. Experience the breathtakingly beautiful yoga studio with expansive views of the coastal Pacific Ocean. Let the sea breeze kiss your skin and be awed by the magnificence of your surroundings as you relax and recharge in this incredible space. Our yoga instructors come from all over the world to share their practice with you. Surfing is what you do in Popoyo, and there is little wonder why. With some of the most pristine, uncrowded and diverse surf breaks in Nicaragua, Popoyo has your surfing needs covered no matter what level you are. Dine in one of the most relaxing environments in Nicaragua, overlooking the Pacific Ocean from every window of our open air, ceder finished restaurant. Our bar staff can shake up a range of delicious cocktails, or, if sipping a beer is more your style, we also have a wide range to choose from. These brand new studio apartments take the Magnific Rock experience to the next level. 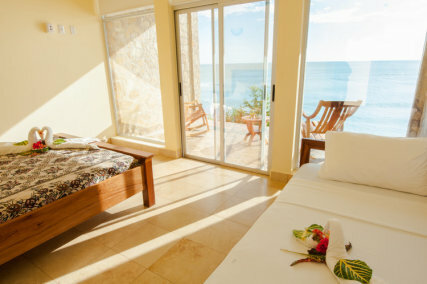 Enjoy ultimate ocean views from the comfort of your tastefully furnished, freshly air to conditioned room, or from your own private balcony. The studio apartments are a perfect retreat for those looking for some quiet time to really savor the magnificence of Magnific Rock. 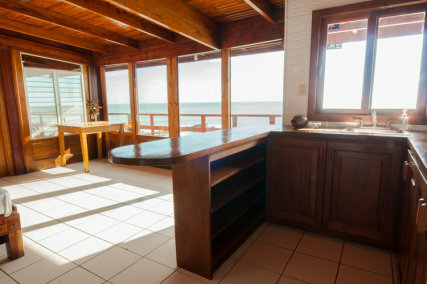 Sleeping up to 4 people, our self to contained, apartments are perfect for a romantic getaway, surf trip or yoga retreat. Perched upon a cliff, offering the most impressive views overlooking Popoyo’s famed Outer Reef and main breaks, you’ll soon realize why we love this place. The box seats for watching the waves roll in and Popoyo beach buzz below you. Feel as though you are floating in mid to air, as you are awed by the view from your bed or lazy day rocking chairs. Thatched roofed dwellings boasting spectacular views and an intimate, romantic vibe! These beautifully built ranchos are ideal for those who want a little escape and some privacy. With open to faced views of the Popoyo Surf Break, you will be pleasantly surprised by how much you enjoy this serene style of living. From the highest point of Magnific Rock, the loft room perfectly frames the sunny, starry or sunsetting skies and shorelines sights, and welcomes in soothing ocean sounds. Attached to our incredible yoga studio, the loft is just right for surf or yoga lovers. The tiki room perfectly frames the sunny, starry or sunsetting skies and shorelines sights, and welcomes in soothing ocean sounds. 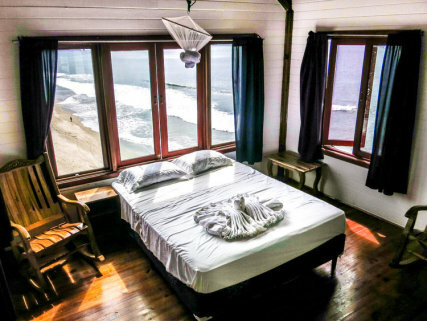 Attached to one of our incredible smaller guest yoga studios, the loft is just right for surf or yoga lovers. Connect with your awesome room mates, and live the Popoyo way. 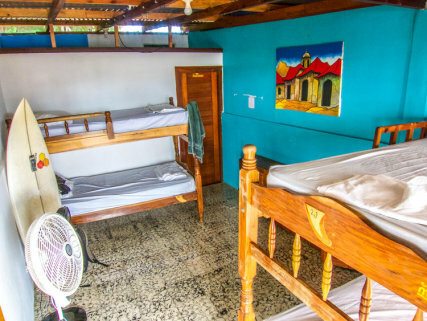 Our dormitory cabinas sleep up to 4 people, superb for gracious yogis, frothing surfers or easygoing solo travellers. Read a book or mellow out in the hammocks in front, and when the conditions look good, jump up and hit the surf! When you book you will receive our confirmation email with full travel directions of how to get to us. We provide Airport Transfers from and to Managua and they can be booked in the booking steps. Surf Lessons can be added in the booking steps if they are not already included in a package. A small deposit is required to secure your booking. Your balance is due at check in. To cancel go to the MyAccount section and log in or register and you can cancel from within your account. Your deposit is non refundable but can be used for the same property/surf school within one year of your original booking. You can cancel anytime up to 30 days before travelling you will not be charged the balance. Surfholidays has handpicked the world’s top surf camps, accommodation & surf schools so you will have peace of mind and an unforgettable trip that meets your exact requirements. You can book instantly or message a host directly & request a custom option. Once you are happy with the trip, you can easily book via Surfholidays’ secure payment platform. Our team at Surfholidays and your local host onsite are available before and during your trip to ensure things run smoothly. Surfholidays hosts ensure that you will have the best experience based on up-to-date local insights. On top of that, the vast majority of your money will go straight to support and grow local surf towns. If you are not fully satisfied, we’ll work with you to make it right. Is the place for your Surf Level? Would it suit a family or a solo travellers? Kate is a certified yoga teacher, avid surfer and passionate community facilitator. Having worked five years a s a financial analyst in Australia, Kate studied yoga in Nicaragua before deciding to make use of her financial background by taking a role as operations manager and group bookings facilitator at Magnific Rock Hotel.